Daniel and his little sister, Cynthia, run the Tool Shop. The inventors will have shop hardware and tools for sale. 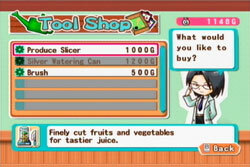 The shop hardware will add more mini-games to your shop, and the tools help make your farm work a little easier. Each of the shops you run (Juice, Egg, and Ice Cream) have a series of mini-games you play in order to produce items your customers request. If you buy additional hardware pieces, you add more mini-games to each shop. More mini-games means you earn more points per customer and you will earn more money for your finished products. Cynthia and Daniel will invent Fertilizer at the beginning of the game. Fertilizer will make your newly seeded crops become full grown the next day. After the inventor pair discover Fertilizer, it will be for sale at the Seed Shop. The Tool Shop also sells the Brush and Watering Can tools. When you buy upgrades for your Brush, you won't have to brush your cows as often. The upgrades for the Watering Can will saturate your crop soil for longer, so you don't have to water as often.